With the Tennant model T1 micro walk-behind scrubber, you can clean floor five times faster than a traditional mop and bucket. The T1 in its standard form is cord electric, but is available with maintenance free AGM batteries. Optional lithium ion battery provides twenty times longer battery life. T1 squeegees are mounted in a unique fashion one set forward another set behind the fifteen inch cylindrical brush. This design feature allows for “bi-directional” cleaning. Use the T1 in tight spaces like under tables, under desks, and into corners. Nylon bristle brush is standard on the T1. If needed, your T1 can be ordered with a polypropylene bristle brush, or for heavy cleaning jobs, an abrasive bristle brush. No tools are necessary to replace the T1 brush. Folding handle on the T1 was designed with limited storage space in mind. Once folded the T1 is only twenty four inches tall! With its on-board transport wheels, the T1 can go up or down stairs and delivery via car or truck is a breeze. 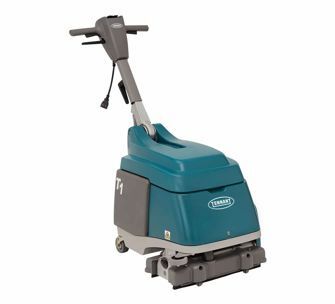 The T1 is the only micro floor scrubber in its class with a cast aluminum frame, and scrub head. This design is superior for resisting corrosion and impacts. Rotational molded tanks on the T1 are very rugged and designed for easy fill and dump.